Home »NMUN2017»National Model United Nations 2017 is in session! National Model United Nations 2017 is in session! 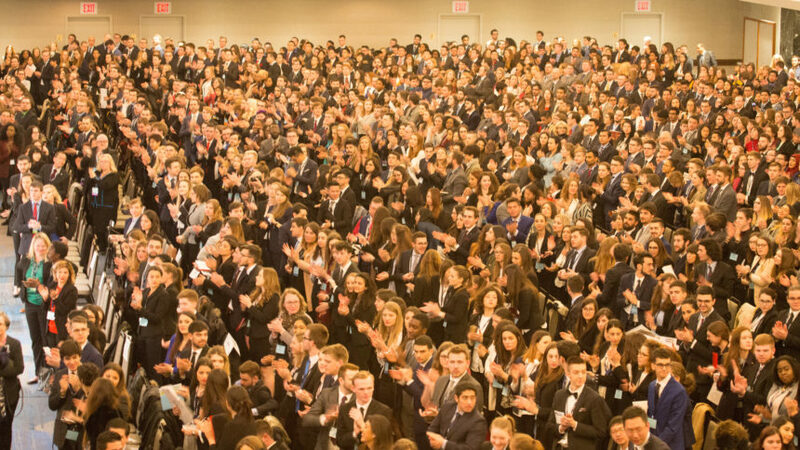 On 19th of March 2017 the annual NMUN conference was declared as open by our honourable Secretary-General Patrick Parsons. About 3.000 delegates from several nations took part at the opening ceremony in the Hilton Ballroom. Hina Shamsi was holding an inspiring keynote speech upon human rights and the neccessarity of cooperation of all member states in this days and topic. Shamsi is the director of the ACLU National Security Project, which is dedicated to ensuring that U.S. national security policies and practices are consistent with the Constitution, civil liberties, and human rights. She has litigated cases upholding the freedoms of speech and association, and challenging targeted killing, torture, unlawful detention, and post-9/11 discrimination against racial and religious minorities. Another focus was laid on the US-travelban for passholders from mostly muslim-embossed countries. Michael Eaton, Executive Director of the NCCA/NMUN, was expressing the harmfulness of those decision during his leading speech at the begin of the opening ceremony as well. The fact that it doesn’t matter were you are from at this educational experience was honoured by the attending students and facultys in the Hilton hotel by massive applause. At the end of the 1-hour ceremony the honourable Secretary-General Patrick Parsons was stressing the importance of diversity and new energy for the United Nations and the leaders of tomorrow, before declaring the Nation Model United Nations 2017 as officially open. The conference will take place in New York City until 24th of March. 18 students from the Westfälische Hochschule are attending and will represent their assigned country The Republic of Korea in several commitees.